If you enjoy canoeing and kayaking or are looking for a nice area to spend your weekend, this page is the right place. 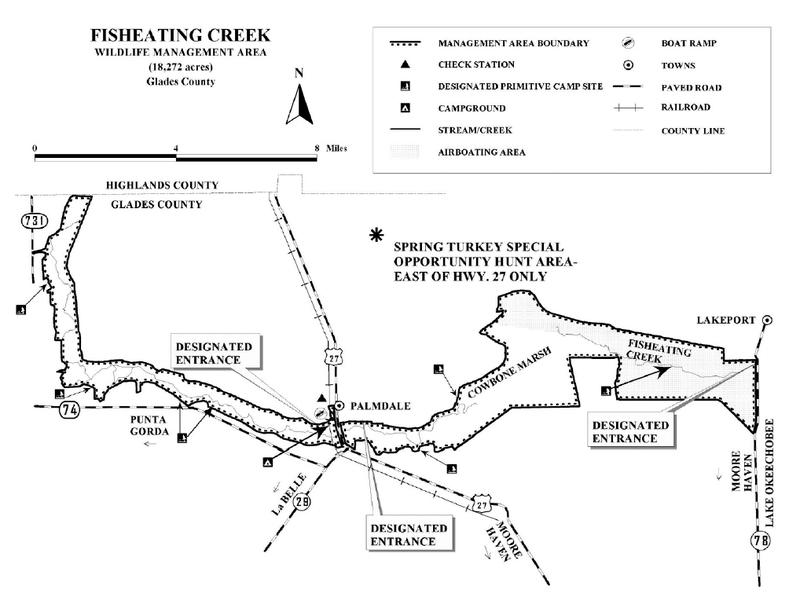 Fisheating Creek Wildlife Management Area is located in Glades County. Visitors may access the west sector of the management area at the Fisheating Creek Campground. The campground is on US 27, approximately 15 miles northwest of Moore Haven, two miles north of the intersection of Hwy 29 and one mile south of Palmdale. Boaters may enter the eastern sector of the management area at the boat ramp located on Hwy 78, one mile south of Lakeport. Hikers may enter the east sector through the access road located two miles south of Lakeport on Hwy 78. Fisheating Creek is a little creek that drains water from Highlands County into Lake Okeechobee in South Central Florida. Until about two years ago, the creek was mostly private land with no public access, until the State of Florida bought the property and turned it into a part of the Florida Trails program. The creek meanders through miles of cypress forest and prairie. During low water times, it is very easy to follow the creek, but during higher water times, the State installed direction signs to help keep you within the boundaries of the stream. They also installed mile markers to give you references of where you are on the creek. During the program with III, most of participants enjoy the opportunity to explore the fascinating world of nature - jungles full of exotic plants and flowers and the waters of the Fisheating Creek, full of fish and gators. The trip is perfectly safe and it is just a short ride from LaBelle to the kayaks launching areas. It makes a perfect opportunity to have a great, adventurous weekend. PALMDALE, July 12, 2007 — Even before we arrived at Fisheating Creek, signs of wild Florida began to appear along a lonely stretch of U.S. 27 north of Moore Haven.